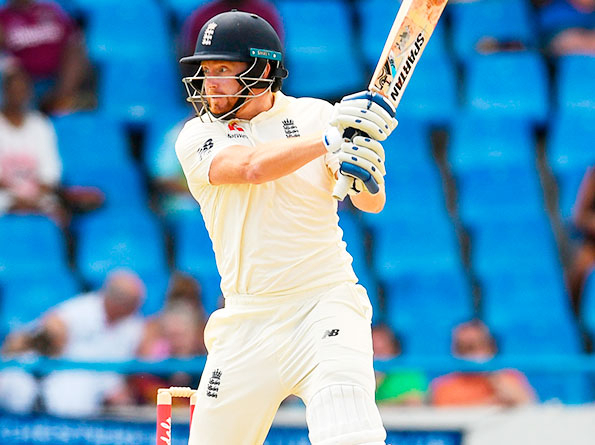 Antigua: Jonny Bairstow expects England to make full use of the capricious Antigua pitch after sharing his delight at a half-century made in spite of the testing conditions at the start of the second Test against the West Indies. A slightly frustrating final session on day one for Joe Root’s bowlers took them to 89 overs in the series without a wicket, as the openers John Campbell and Kraigg Brathwaite repelled all the tourists could offer on a surface of considerable variable bounce. Bairstow, who described himself as “chuffed” at making 52 from his new No. 3 role in England’s 187 all out, felt the response from the home side was slightly fortuitous and insisted his teammates remain very much in the contest. He said: “I don’t see there being any problem [with the pitch], both teams have to bat on it. “For them to only score 30 runs off 21 overs at the end was testament to our bowlers and on another day we could have picked up a couple of wickets. Bairstow ended day one behind the stumps once more after Ben Foakes suffered heavy bruising to his right hand when struck by a Shannon Gabriel short ball which dismissed the batsman after a second deflection. Australia will play top-ranked England and Sri Lanka in their last warm-up matches before defending their Cricket World Cup crown. All 10 teams will play two warm-ups each over May 24-28 before the tournament begins on May 30 in London. The games are spread over Bristol, Cardiff, Southampton, and London. The games will be 50 overs per side but not carry official one-day international status as teams can field their entire 15-man squads.